Minnesota Compass has prepared an in-depth profile of Columbia Park neighborhood, based on US census data, along with profiles for all other Minneapolis and St. Paul neighborhoods and surrounding cities. Download data files from the Minnesota Compass web site. Columbia Park residents and workers are served by Metro Transit bus routes 10, 11 (see detour announcement), 59, and 118. Columbia Park includes the 18-hole Columbia Golf Club (established in 1919) and the Columbia Manor (built in 1925 and overlooking the golf course and available for wedding receptions, family reunions, anniversary parties, etc. ), driving range, picnic area, rugby pitch (used by Metropolis Rugby Football Club and others), winter sliding hill (some call it the city’s best), cross-country skiing, and running, biking and walking paths. Dog park – south side of St. Anthony Parkway near driving range (see summary of off-leash areas and regulations). 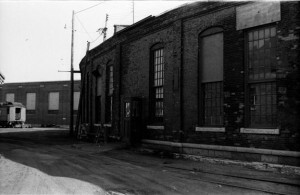 This 1998 image of the exterior of the Shoreham Yards roundhouse is courtesy Mike Melman. The interior of the Shoreham Yards roundhouse was photographed in 1998 by Columbia Park resident Mike Melman, and appeared in his book, 'The Quiet Hours,' published in 2003 by University of Minnesota Press. 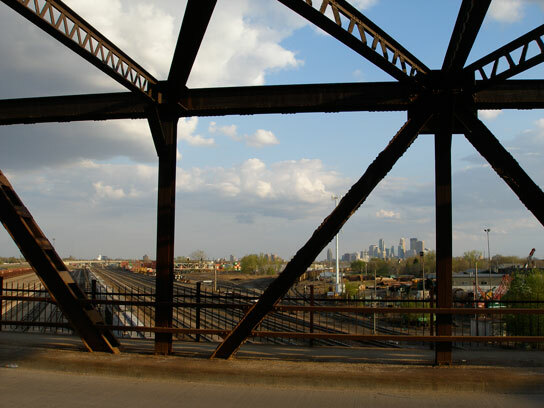 This April 2007 photo by Peter Doughty, through the St. Anthony Parkway bridge over the Burlington Northern Railroad tracks, shows the downtown Minneapolis skyline in the distance. 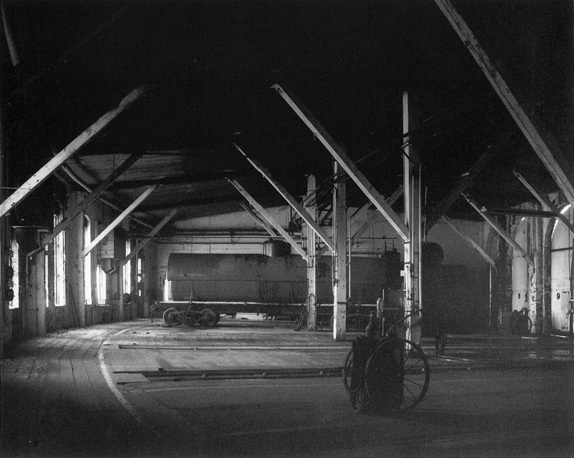 Many freight trains and several commuter trains of the Northstar Line pass under this bridge each day. 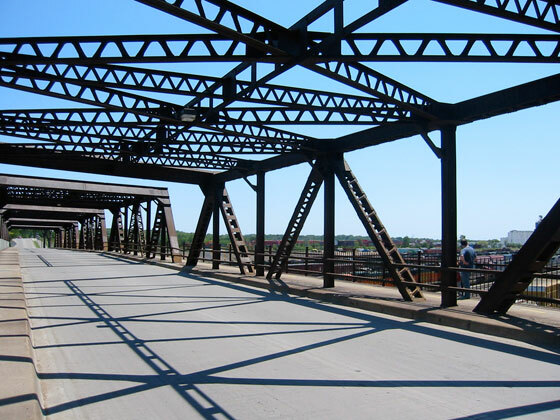 This view of the St. Anthony Parkway bridge over the Burlington Northern Railroad tracks was captured by Columbia Park resident Peter Doughty in June 2009. Alley Cat Community Garden, begun in 2010, using Hennepin County-owned land at the fork in the alley between Architect Avenue and Van Buren Street, between Columbia Parkway and 37th Avenue Northeast. Learning for Leadership Charter School, now in its sixth year. Businesses: energy industry software developer Open Access Technology Inc., Custom Business Forms (printer of our newsletter), Midcontinent Engineering, and others. Decorative stelae “The 4020” along Central Avenue NE at 33rd Avenue NE, depicting the history of the neighborhood and featuring numerous rail motifs, by Northeast sculptor Foster Willey Jr., with custom benches.” – See Start Seeing Art. See also Minnesota Sculptors. St. Anthony Cemetery, 2730 Central Avenue NE, encompassing 13 acres and operated by the Archdiocese of Saint Paul and Minneapolis — begun in 1857 by St. Anthony’s Parish. Map of entire Northeast with Columbia Park – Ward 1 map (PDF). 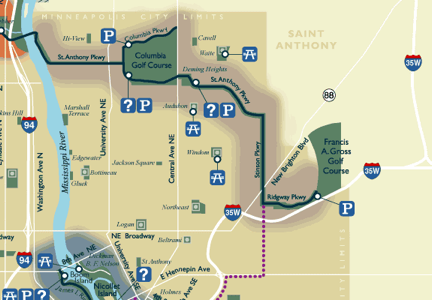 Links to historic maps of Minneapolis are included in the Tracks of the Past post at Getting Around Minneapolis.